Location of Site: The area known as Florence Court takes up the majority of a city block, bounded by University Avenue SE on the north, 2nd Street SE on the south, 10th Avenue SE on the west, and 11th Avenue SE on the east. Florence Court is a multi-structure site including an L-shaped row house complex (#8-#18), four cottages (#19, #20, #25, and #27), and one larger brick dwelling (1018 University Avenue SE). The site is currently (as of November 2009) in the early stages of redevelopment and renovation. The L-shaped row houses described above and the larger brick house were built in 1886 by Jeremiah Spear, who also acted as the architect and real estate agent. The four cottages were moved to the site in 1921. The structures form a U-shape facing a central courtyard, which is traversed by a driveway that follows the contour of the L-shaped structure,with entrances from University Avenue SE and 11th Avenue SE. The site has always been used for private residence. In its early years it was occupied by middle-class families including workers on the Great Northern Railroad and members of the University of Minnesota's faculty. It is currently occupied mainly by students of the University and other young adults living and working in the Twin Cities. 1018 University Avenue SE is a 2 1/2 story house built on-site in 1886 by Jeremiah Spear. 1022 University Avenue #8-18 comprise the L-shaped structure described above. It was built on the site in 1886 by Jeremiah Spear. 1022 University Avenue Cottage #19 is a 1 1/2 story wood-frame cottage built in 1880, and moved to Florence Court in 1921. 1022 University Avenue Cottage #20 is a 1 1/2 story wood-frame cottage built in 1870, and moved to Florence Court in 1921. 1022 University Avenue Cottage #25 is a 1 1/2 story wood-frame cottage built in 1887 and moved to Florence Court in 1923. 1022 University Avenue Cottage #27 is a wood-frame cottage built in 1900 and moved to Florence Court in 1921. 1000 University Avenue SE is a gas station and an auto repair shop that occupies the northwest corner of the site. The Florence Court complex, and especially the 1886 row houses, are an excellent example of early urban planning in Minneapolis. The row houses are the earliest surviving example in the city of this type of building. The addition of the cottages in the early 1920s and their alteration to fit the style of the row houses reinforces the planned aspect of this housing development. 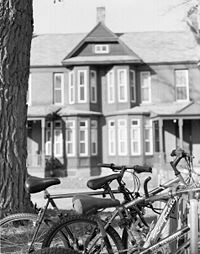 The location of the complex is also integral in its significance; its proximity to the University of Minnesota and the Great Northern Railroad made it an ideal location for housing employees of those entities. Florence Court is currently in the early stages of renovation and redevelopment. The row houses/apartments are being renovated as part of a compromise between the Marcy Holmes Neighborhood Association and the owner of the site, who plans to build a six-story apartment complex on the north side of the site, facing University Avenue. It should be noted that the exterior of the row houses is the only part of the site that has received official historic designation; the interiors of this complex (many of which contain original woodwork) and the cottages are not protected from demolition or alteration. These changes are viewed with disfavor by many of the residents (both past and present) and a small protest movement has begun on social networking sites like Facebook and MySpace (see links below). “National Register of Historic Places – Nomination Form,” June 1981. This page was last modified on February 15, 2019, at 19:04. This page has been accessed 112,541 times.